Camilia temporarily relieves symptoms of teething, including painful gums and irritability, as well as minor digestive disorders sometimes associated with teething. * Camilia does not interact with other medications, it is not contraindicated with pre-existing conditions, and there is no risk of overdose or numbing your babyÍs gag reflex. The sterile, single-use liquid doses are preservative-free and help to prevent contamination. They do not contain benzocaine, alcohol, flavors, dyes, lactose, sugar or artificial sweeteners. 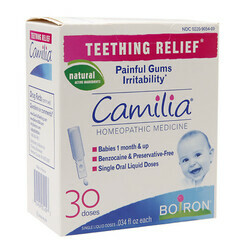 Recommended for babies one month and up, Camilia works best when taken at the first sign of teething.